I went into town on my daily run to mail parts this morning. I had to bust through about 12 inches of snow to get going. 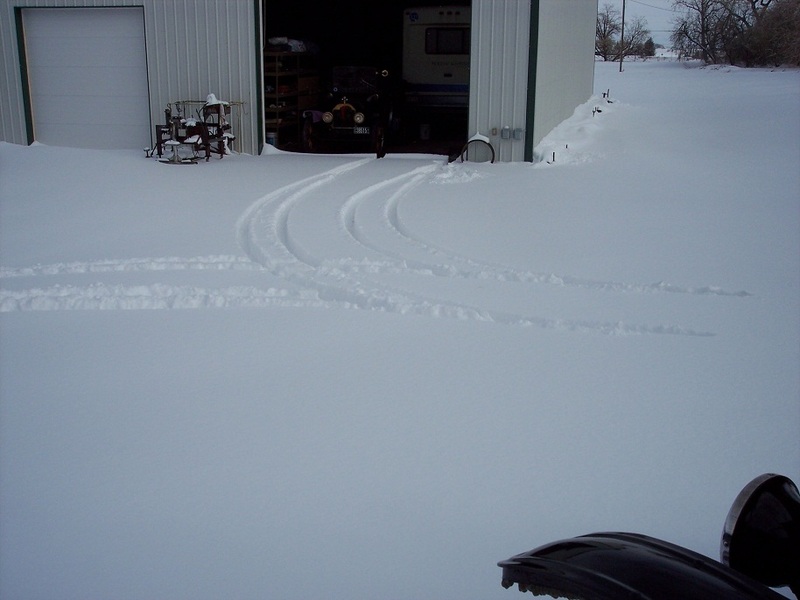 When I got to the highway I could not get through the snow that had been plowed by the State. I had to back up and get a run at it. After I got finished at the Post Office I stopped by the Jumping Bean Cafe to have a cup of Coffee. Note the huge birdhouse in front, just over the hood. I was parked across the street from the local Marijuana Shop. Marijuana shops are legal in Colorado. I didn't see any of the local junkies going in and out, it must have been too early in the day for them. Since you posted it: Just because Colorado says it's legal doesn't make it so...Marijuana of any kind is still illegal in the US under Federal Law. 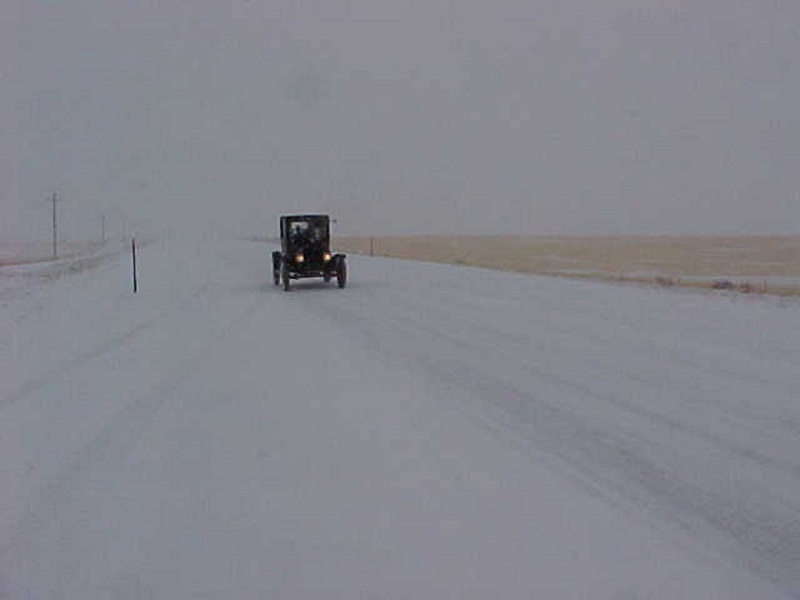 I like it that you drive your T's daily and even in the snow. Do you have much salting and cindering of the roads up there? Your right, I believe that some of the shops were closed up by the Feds but not many. The pot shops are legal under Colorado Law, some towns have 3 or 4 right on main street. There was a big law suit in Longmont by the pot shops becasue Longmont decided to close them up. I think a judge threw the suit out. By the way the pot shop in the picture above was taken right on main street in the center of town in Berthoud. I don't usually go to the Jumping Bean for Coffee but what few times I have I have never seen a junkie go in or out. Maybe they go in after dark so people in a small town don't see them. I live about 20 miles south of Dave. 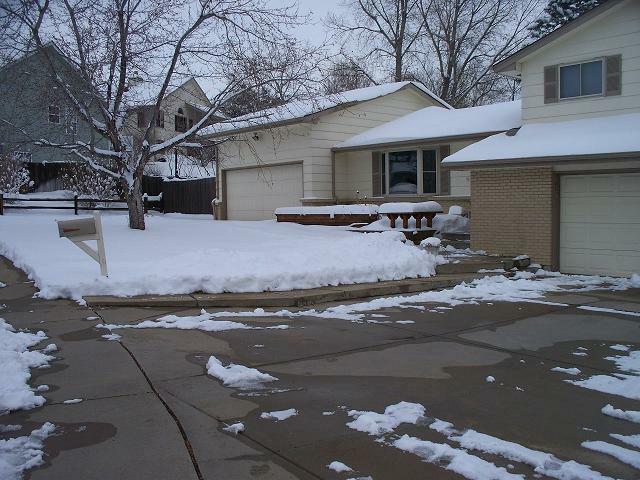 Here is what my house looks like after shoveling the sidewalk and driveway. 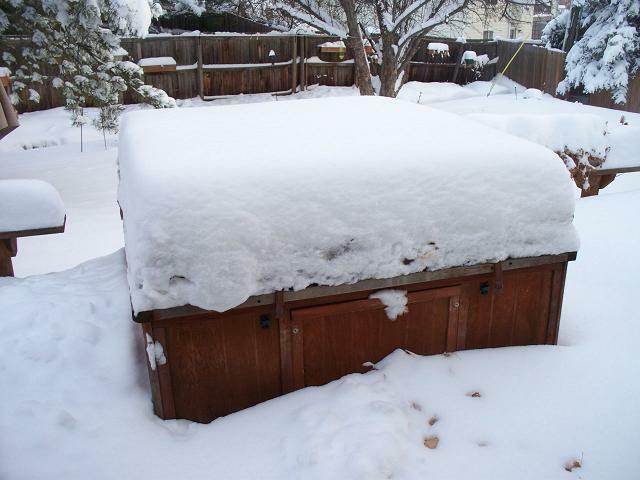 Here is the Hot Tub on the back deck! I don't believe salt is used in Colorado, however they do use tons of Mag Chloride which is just about as bad. Fortunatly our average high temperature here is 45 derees in the winter so we don't have to drive in it too often. Normally what little snow we get is gone in a day or two. 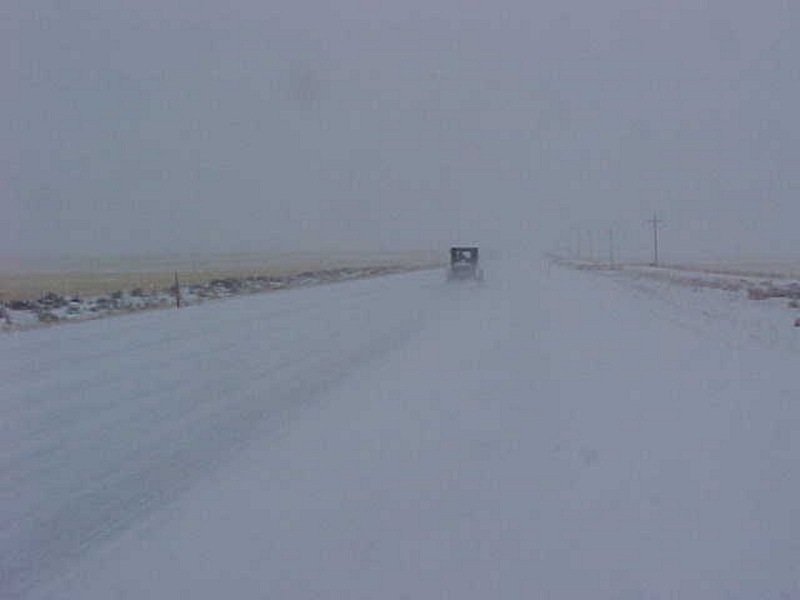 Cought in a blizzard in Wyoming out side of Sasratoga. Another shot of the Saratoga Snow Storm. I didn't think I would make it back to Colorado over Cameron Pass, but did. We lucked out this week, weather-wise, here on Long Island. Today, we were reading 53 degrees F. I wish it could last. That's way to cold for me!! It was 65 degrees in the Colonial Capital today. Hard to believe it's the first day of Winter. It is 19 here at 5:30. The forcast low is for 2 degres F tonight. Just curious. Do those places actually sell dope or just the paraphanalia (Sp?) used to smoke it? We have "Head shops" here that sell stuff like scales, rolling papers, and "Tobacco" pipes, and crap like that, but not the dope itself. Or at least not openly. Lord only know what they really do. Can't say I've ever been in one, but I hear their ads on the radio. They sell real dope. There are hundreds of them here in Denver. You have to have a medical marijuana prescription from a "Dr". I love snow, but don't know if I love it that much. The snow is a minor annoyance. As Dave stated it�s usually gone in a day or two. The main pain is that most cities require you to shovel the sidewalk and driveway within 24 hours of the end of the snow storm. I normally have to do this a couple of times a year. There are years that I don't have to shovel at all and then there are years that you curse the snow. ...most cities require you to shovel the sidewalk and driveway within 24 hours of the end of the snow storm. Another reason I'm happy not to live in town. Don't own a snow shovel and don't want one either!! I am with you. I would love to live outside of the city. Yes, the city can cite and fine you for not clearing the sidewalks and driveways. If I had it my way I would live a lot closer to Dave. If the real estate market ever recovers I will make it happen. Thanks Washington, My house has lost almost 1/3 of its value. LOL. It just occurred to me that this is one of the amenities you would have received for being annexed into a city. If we had 1/5 that much snow down south, every grocery store would be completely out of bread and milk. No milk sandwiches! Helping my girl friend with her home Apprasial bussness we have found some 1 mil $ homes 4 year ago new and are now half that.I would love to live out of town but can't afford to hire 4 semi,s + to move all my (Cr#p) Things now being retired and the home value thing dosn't help eather. Ther are some good buys out there we've seen. After living 12 years in Alaska and 8 years in Golden Co. I'm to old for any more snow. I'll take the Wa. rain for now. Is Dan Robatelli (sp) still aound? I'm with you....I don't own a snow shovel and don't want one either!! I am not too old for snow yet. You are right that there are some good buys out there but most of us cannot take advantage of them. I think I would need about 4 semis to move my cr#p as well! I have missed the last 2 T meetings but the last one I attended there was a report that Dan Robitaille is still with us. I drove my 26 Coupe to Golden a week ago before the weather turned to cr#p. It is one of my favorite T drives. I went to Chet Jackson's funeral (He was known as Mr Model T in Colorado). We all drove Model Ts. After the funeral we all drove our Ts to Ron Jackson, Chet Oldest boy's house. I sat and talked with Dan Robitaille for quite awhile about old times in the T club. He seemed quite well. You are supposed to have some kind of card from a Doctor. However if you can believe TV the Junkies are getting fake cards or some Doctors are giving the cars out to who ever wants them not legitimate medical cases. According again to TV there is many different types of marijuana that you can buy over the counter but the prices would scare you. Pot is a hangover from Prohibition. 50-60% of the Mexican Mafia profit from illegal drugs is from pot. Our Prohibition laws feed the violent Mexican drug cartels. One of the biggest contributors to fighting Calif Prop 19 that would hava legalized recreational use was Budweiser. Colo gets $25 Million a year in taxes from their legalized trade. Tax and regulate, or jail the users and feed the Mexican Mafia. This is about as much as Lizzy has had to deal with around here so far. Yup, those damn shops are legal around here too, and are supposed to be for "medicinal use only". But the folks I see going in and out one of those "dispensaries" don't look quite like the types needing that particular medicine (their teens mostly). And many of them have on site doctors to make the necessary prescriptions on the spot. I'd like to see them shut down, or legalize it proper and make it so you have to have a legitimate prescription to get it, that way only real Pharmacies could carry it and not those Mexican Mafia store fronts. Of course in T'Junka (Tujunga, pronounced Ta-Hunga, it's a Gabrielano word, meaning "old womans place") it's not uncommon to see most of these people staggering around the streets drunk (booze, there are a lot of bars in Tujunga) and fall into bushes in and around fast food places, happens everyday, but wreathed in a cloud of smoke, wandering the streets because their sick and have a prescription that says so? BS! I guess I like to live with "Old women" When we first got married we lived in Tujunga, and now live at the foot of Viejas Mountain in San Diego County. Here the pot shops have been raided by the feds and closed down most of them. It is legal under California law with a doctor's presscription. By the way, it's been a bit cold here. The high's are around 65. But no snow. You can send some of that snow this way. It would be nice to have a white Christmas. You might have the marijuana problem by you, but we have a couple doc's writing for narcotics like crazy. I try to turn away as many prescriptions as I can, but the boss says fill them. Cash in the register you know. Patients come from all over Milwaukee, go to this one doctor, and then get their narc's filled anywhere in the county. You know they are selling them since they paid cash. DEA can't do much either, nor can the state board. Think you got it bad in Wis? Pharmacies in Florida sell something like 30% of the Hillbilly Heroin, Oxycontin, consumed in the US. There is almost no regulation of their pain doctors. People travel from all over the country to get scripts and buy in quantity there. Where do I get this info? Documentaries on CurrenTV, "War on Weed," and "Oxycontin Express," etc., play repeatedly. Hey Bob Coiro; Don't tempt old man Winter. Enjoy the mild Long Island weather while it lasts. 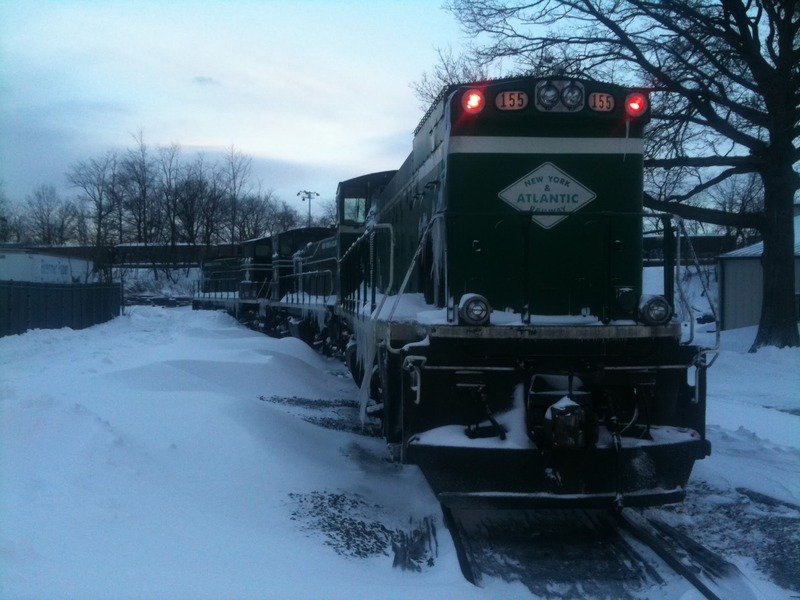 While working on Long Island last year for the New York & Atlantic Railway, I decided to head in to work to beat the Sunday December 26th storm. Figuring I could camp out over night, I ended up being pressed into service about 8pm that night. BTW, due to the city not plowing the roads, I was at work until Thursday afternoon. Here are a few pictures. BTW, I went through one EF-1 tornado and that sort of hurricane last year on Long Island as well. I hope the T people here don't mind these pictures. 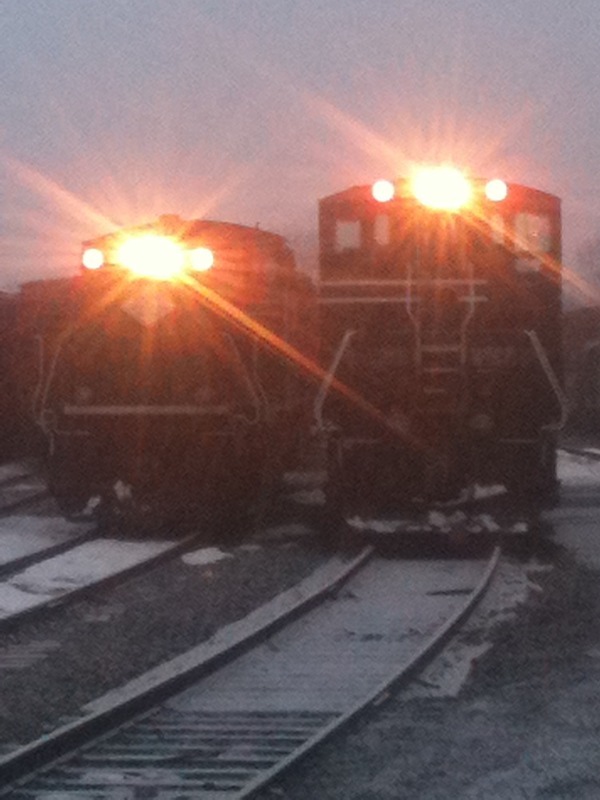 I know a few of you enjoy trains and well, "train" begins with T anyway. Happy holidays to all. 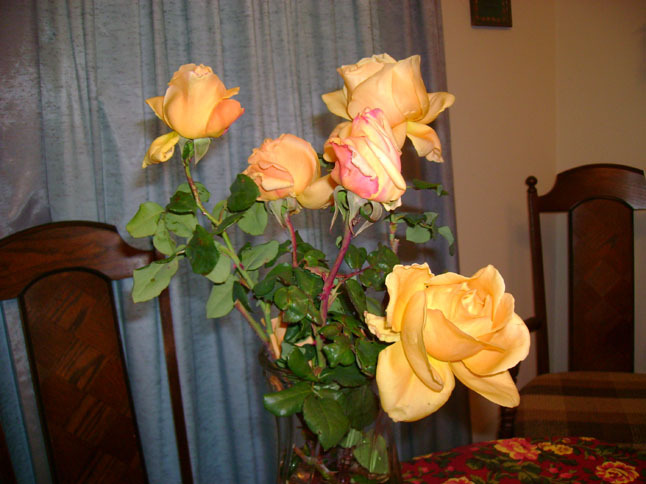 I just went into the back yard and it is getting a bit windy, so I thought I'd pick these before they got damaged. This is why the Football game in Pasadena is called Tournament of Roses. The roses grow all year long in southern California. 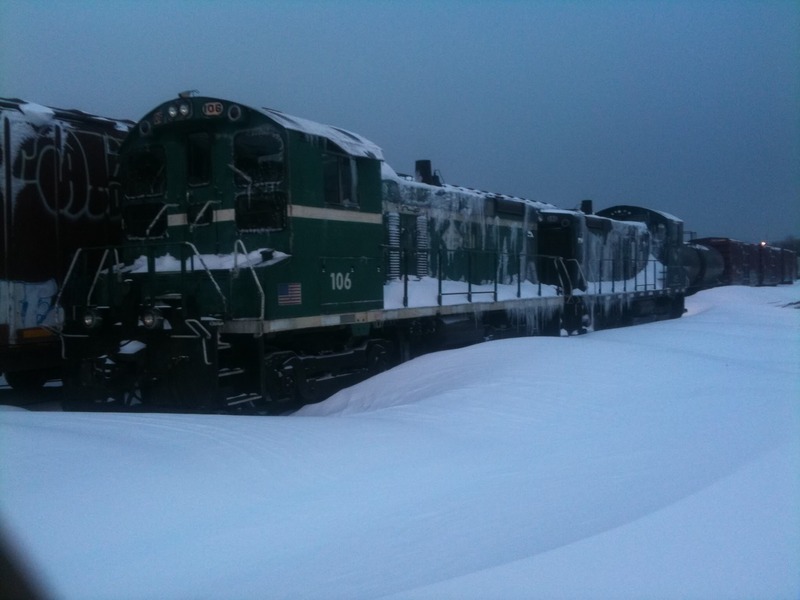 I love to drive the T in the snow when we get it none this year so far. Had a lot of fun in it last year till it came time to polish the brass the salt they used made that a nightmare. Can't say that will stop me this year as I will remember to take a later black T or go over and beg Bob McDonald for a snowmobile ride. Paul, how could anybody not love trains? Taking a cross country trip by rail, eating in a dining car and sleeping in a Pullman car is definitely on my bucket list. Grass Valley is nice. Most of the winter, snow is just up the road five or ten miles. At our house we get enough snow to love it, but not enough to hate it. Not much so far this year. Temperatures in 20s at night. High is about 50 today. We just have to have some wet to go with it. That sounds great ,just remember to bring about 3 ft of snow with you. "Grin"
I forgot Mike you have to take it home with you also.